On complying the Rules and Regulations of Good Manufacturing Practices (GMP). GMP is a system for ensuring products are consistently produced and controlled according to quality standards. It is designed to minimize the risks involved in any industrial production that cannot be eliminated through testing the final product. Companies that follow this system, receive certification from GMP. 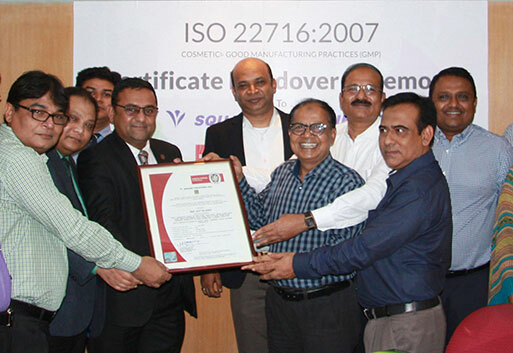 SQUARE Toiletries Limited is the first Toiletries Company among Bangladeshi companies which has officially received ISO 22716:2007 as a recognition that Square Toiletries Limited is following all the guidelines of Good Manufacturing Practices (GMP) like assuring proper design, monitoring, and controlling of manufacturing processes and facilities. The certification was audited and awarded by Bureau Veritas (India) Private Limited. SQUARE Toiletries Limited received this certification for two manufacturing sites in Pabna (Toiletries Division Factory and Spray Division Factory) and Rupshi Factory. SQUARE Toiletries Limited for manufacturing products in the categories like skin care, hair care, fabric care, baby care, men’s grooming, oral care, health care, home care, aerosol products, color cosmetics, laundry soap, toilet soap, feminine, baby hygiene and etc. products received this award. With acquiring this certificate, SQUARE Toiletries Limited is now implementing Cosmetics Good Manufacturing Practices for the followings: validating the conformity of Management System with the new legal requirements, preparing and facilitating the legal inspections by Health Authorities, demonstrating to stakeholders (retailers, product traders, importers etc) that the processes and facilities are in conformity with GMP, inspiring consumers’ confidence, ensuring access to markets (worldwide) and enhancing operating efficiency and competitive market appeal. The certification handover ceremony took place on 5 July, 2018 at Square Center. On behalf of Bureau Veritas (India) Private Limited Mr. Ramesh Koregave (Director, Certification, South Asia), Mr. Sohel Azad (Country Manager, Commodities, Industry & Facilities Division, Bangladesh), Mr. Md. Towfiqul Arif (Head of Certification, Bangladesh) and Mr. Mukut K. Barua (Head of Business Development, Commodities, Industry & Facilities Division, Bangladesh) were present at the event. On behalf of Square Toiletries Limited Mr. Mohammed Abdul Khaleque (Director, Pabna Plant, SQUARE Toiletries Limited) received the certificate. Among other high officials Mr. Golam Kibria (Director, Accounts and Finance, SQUARE Food and Beverage Limited and SQUARE Toiletries Limited), Mr. Malik Mohammed Sayeed (Head of Operations, SQUARE Toiletries Limited), Mr. Zakir Ibne Hai (Chief Executive Officer, Square Food & Beverage Limited), Mr. Golam Rasul Chowdhury (General Manager, Production, Rupshi, SQUARE Toiletries Limited) and other department Heads were present at the event.